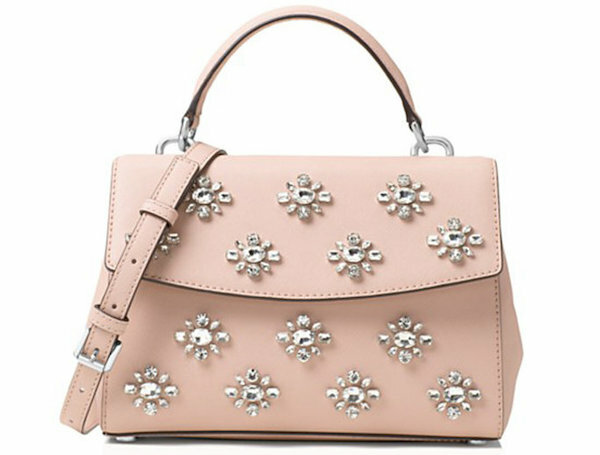 Accessories: Are You A Maximalist Or A Minimalist? Most of us fall somewhere in the middle, I suspect. It depends on the day, the outfit, or the mood, but usually we have a leaning toward one extreme or the other. Some of us stick to a couple of signature accessories, or we may like to layer them on. 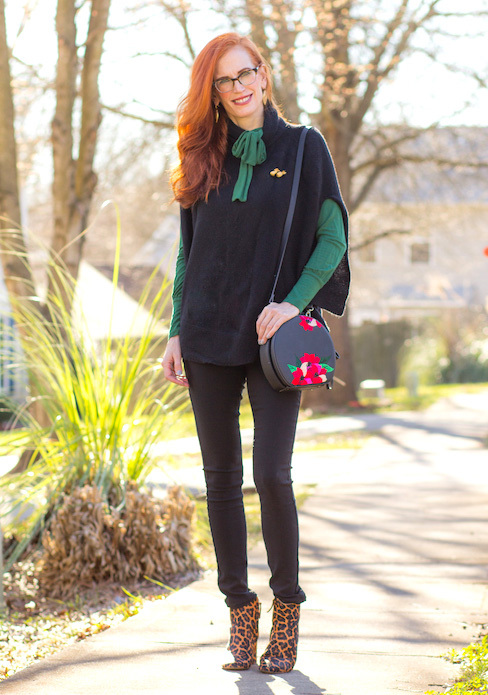 I am usually on Team Minimal, as my style is Modern/Casual/Easy. I sometimes stick a toe over the line to the more accessorized team, because I enjoy that look as well. My accessory idols are women who can make an outfit magical with an unexpected piece or two. A vest, a pair of tights, a scarf, and the net effect is wonderful. Gorgeous Jessica of Elegantly Dressed and Stylish adds just a few, but special, accessories to this classic look. 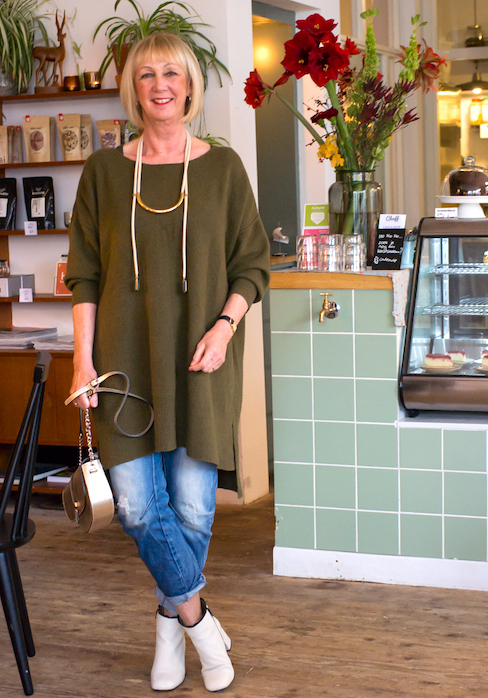 Greetje of No Fear of Fashion accessorizes minimally but with impact. That ivory necklace is perfect, as is the modern metallic purse. And hail Queen Iris Apfel, who wears it all and looks brilliant. I tend to rely on a few favorite bracelets, necklaces, belts and a couple of scarves. I don’t wear many earrings because my curly hair obscures them, and my ear holes have closed up, ouch. That said, I do have the mop of curly hair as a daily accessory, as well as a small collection of hairpieces. I’m not terribly creative with scarves. I will use one for a belt, and most def tuck one into my collar in NYC in February. This is probably as maxed-out as I get, with a necklace, sparkly bracelet, sunglasses and red lips. My favorite cool-weather accessory is patterned or graphic tights. They make me feel whimsical and light hearted, and I always get a comment or two. I’ve also started wearing this fab wool hat from Tenth Street Hats, because it gives me a boho vibe that I love. They have very cool headwear, go give them a look. Also wonderful for days when your hair is behaving like a two year old. Find this hat at Tenth Street. Printed ankle socks with oxfords. 2. More hairpieces that completely change my look. Wearing one of my silver wigs. It’s fun to have thick hair for a day! 3. And shorter necklaces. Not quite chokers, but short enough to be easily seen in an open neck. 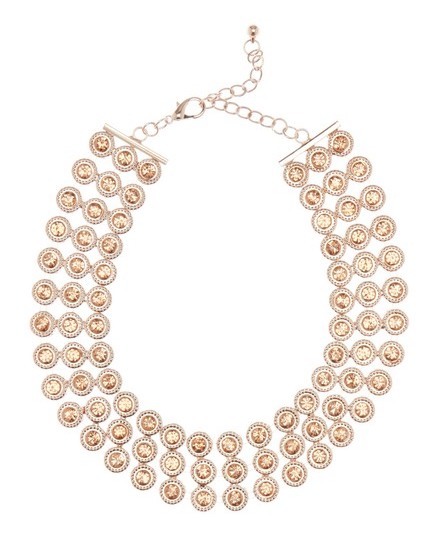 Love this triple strand beaded necklace. How do you prefer to accessorize? Minimal or all the way? I love to see some elegant accessorizing, quality pieces styled with attitude, but I think it’s not for me. I’m probably a maximalist, not because of the number of accessories I like to wear, but because of the size of them (massive!). I love Iris Apfel! It depends on my outfit, but I definitely have maximalist tendencies! I wearing 8+ rings on a regular basis, always have 7 earrings total on, and I am known to wear multiple necklaces and/or earrings! And sometimes, it’s just a pair of earrings. Belts and scarves, I deploy less frequently – I do love a playful pair of hosiery! I wear more accessories in the summer because my clothing is simpler, and with bare arms and neck, I can wear bracelets, and bigger earrings. In winter I am more minimal – my rings and smaller earrings. I love Iris’ over the top accessorizing, but I just can’t do it. 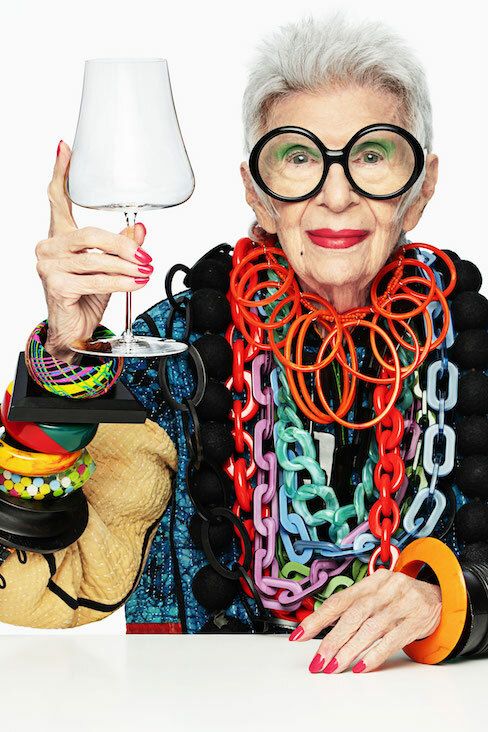 Well, compared to Iris Apfel I’m definitely a minimalist with accessories, but, in reality, I’m probably somewhere in the middle. Iris looks smashing, though, with all of the bracelets and necklaces, something I could never carry off. You look smashing also in all your looks. 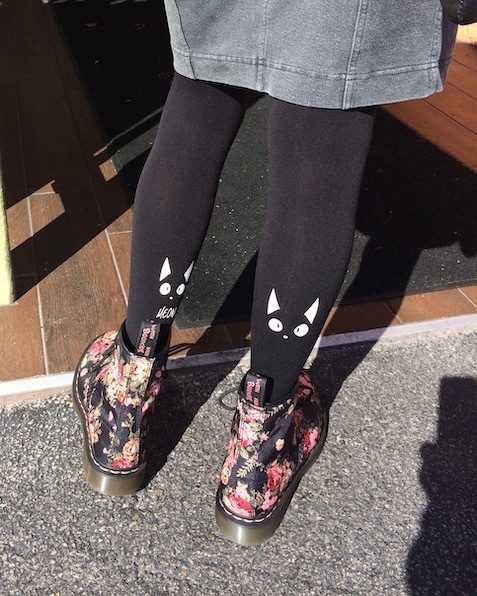 I truly love the graphic tights with cats, so very cute. I love how you wear hairpieces as accessories. I have a few I use but have never worn a full-on wig, but you have me thinking now. Is your wig comfortable to wear and not itchy? Thanks for sharing all these great looks! This one got me thinking Patti. I guess I am mostly somewhere in the middle. I tend to use my accessories to ring the changes and add colour to my blacks. From your examples, I’m a minimalist with impact. You’ve certainly found some great examples. I appreciate your kitty tights, what a fun idea. 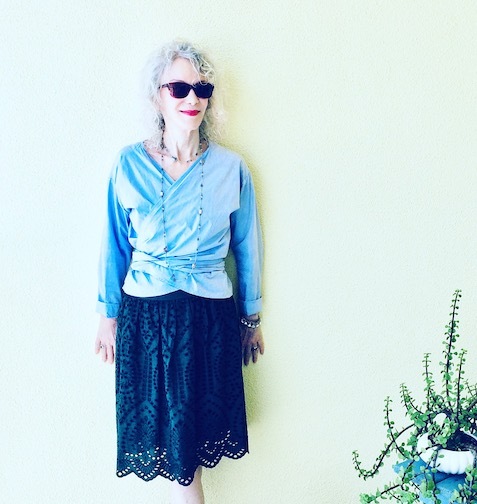 I love your blue eyelet skirt, yes I do see and appreciate that you are more of a minimalist. 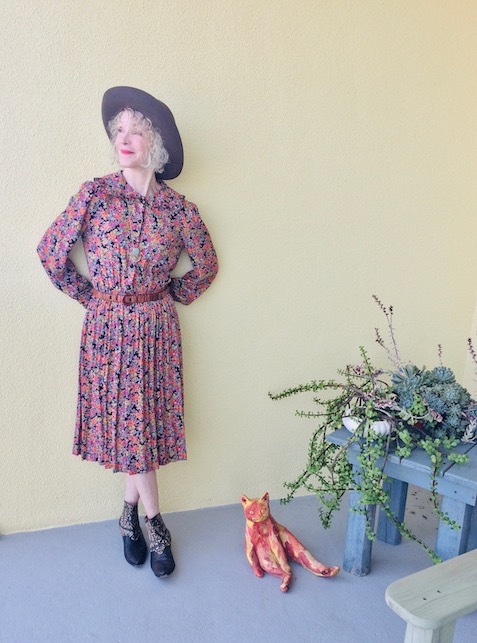 On the blog, I tend to be much more maximal in my style. I’m a little bit more subdued in real life. I love the examples of Jessica and Greetje! Those tights?? Yes…those are so fun!! I have gotten into fun tights lately!! Patti, I would love it if you did a wig/hairpiece post. I generally go for one statement piece, usually a brooch or necklace. 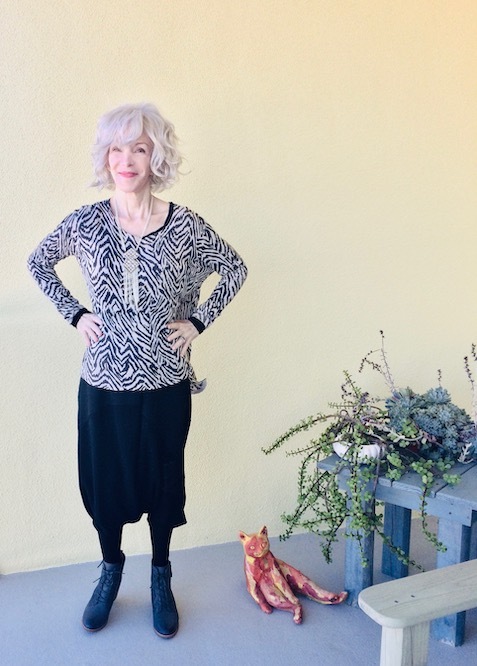 My hair is much like yours, silver and very curly, and also a “statement item,” so much as I love earrings, they get lost or tangled in that mop. If I had your slim legs, statement shoes and socks would be part of my repertoire. Alas. Not to be but a nice reminder nonetheless to have fun. I think I am a minimalist with accessories. I often forget to add them but I think they do complete a look. And there are times when go full on! Fun post! 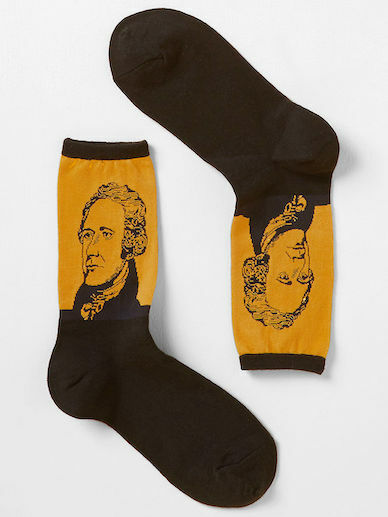 I love wacky socks with pants. Discreet anarchy. Almost always earrings. For a long time, I wore diamond studs that my dad had bought my grandma. Then, while staying at my brother’s house, I was taking them off and one popped out of my fingers. I looked under the vanity in the bathroom and discovered it went down the A/C floor vent. So I know where it is, but I can’t get it without tearing his house apart. Sigh. I might get another piercing to wear the remaining stud on one ear.